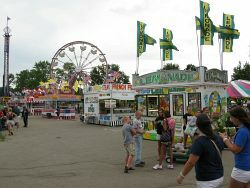 The Ingham County Fair is held each year in August in Mason at the fairgrounds about a mile from my house. 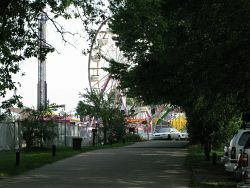 I often go by or through the fairgrounds on my exercise walks. The grounds extend from Ash Street to Kipp Road, so it's a logical path for some of my walks, frequently taken late at night. 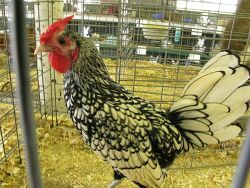 This year I had a special reason for visiting the fair. 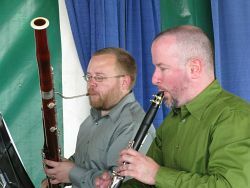 Shortly after I arrived in Mason over ten years ago I entered my chocolate fudge in competition at the fair and finished in 2nd place. This year I decided to give it another try, but I included dried cherries in the fudge this time, cherries I picked from the tree in front of the Mason Public Library. But, once again, I finished in 2nd place. After checking my results (and buying a bunch of other competition goodies, bad for the diet!) 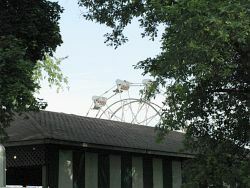 I wondered around the fairgrounds and took a few pictures. 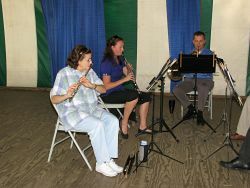 I especially enjoyed the music of the Capital Wind Quintet (member names documented with the photos below along with other comments). 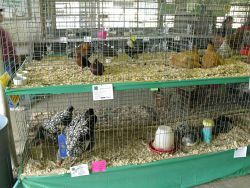 Another area of competition at the fair is with animals, food items, and other farm products. 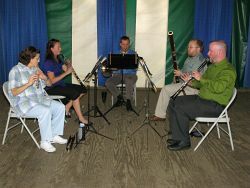 4H is big in this area. 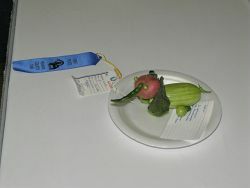 I took several photos of the animal figures made out of vegetables. 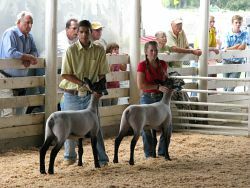 The first two photos show the lamb competition. 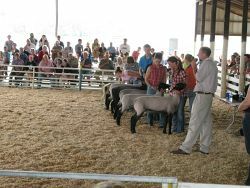 The judge was commenting on the correct methodology of showing lambs, a teaching moment for the young people in the competition. 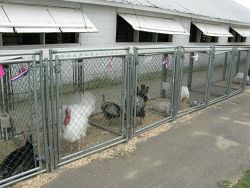 The third photo shows some of the turkeys in the competition. They were making quite a racket ... gooble, gooble! 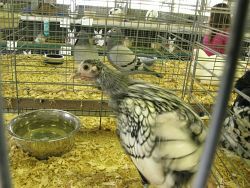 Ingham County Fair. 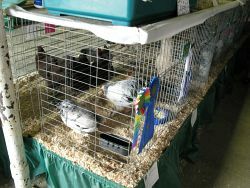 Some of the birds in competition. 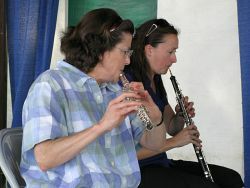 Ingham County Fair. 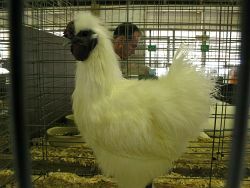 Some of the chickens in competition. 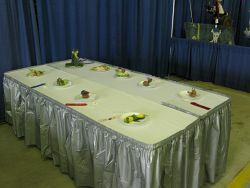 Table of food art made of vegetables. 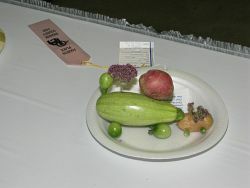 Ingham County Fair. 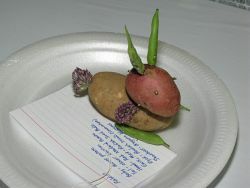 Food art made of vegetables. 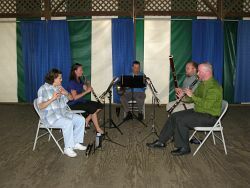 I was impressed how they carried on and created great music. 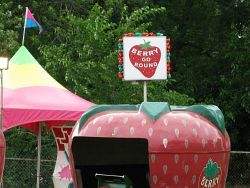 The wind was blowing, the machines operating the midway rides was noisy, children were crying, and the crying of "N-43", "O-62", etc. were coming from the bingo game next door, and they just kept playing. Bravo! 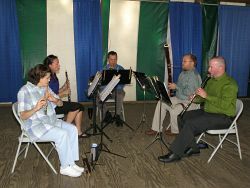 Capital Wind Quintet. 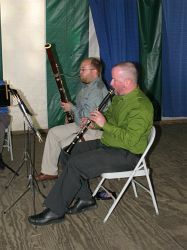 The battle against the wind was on-going. 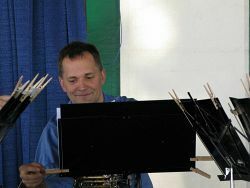 Note the clothes pins on the music stands holding the music in place. 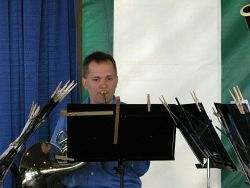 At least once I saw one of the musicians catch his music stand as the wind was blowing it over ... and he didn't miss a beat. Impressive! 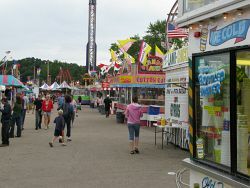 Ingham County Fair. 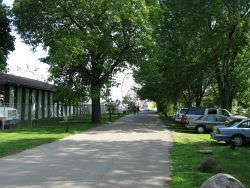 Photos taken as I exited to the parking area.